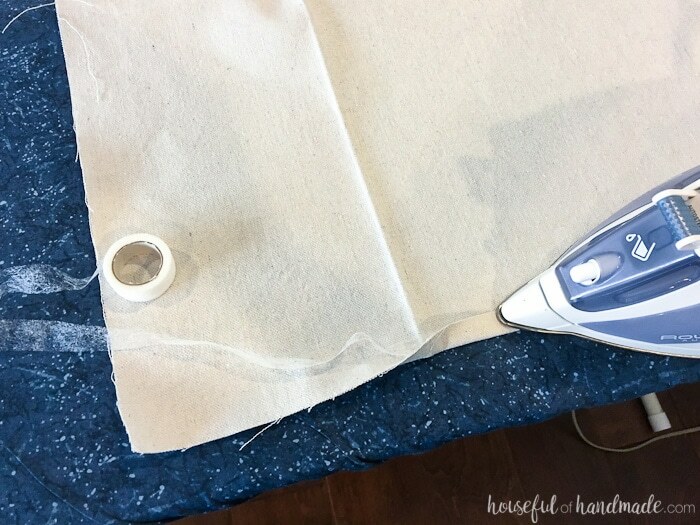 I use iron on hem tape to hem things without sewing. Great for Halloween costumes. I found an inexpensive one at Michael’s and used a coupon to get it for a deal. Measure the bust of your child and how long you want the top. 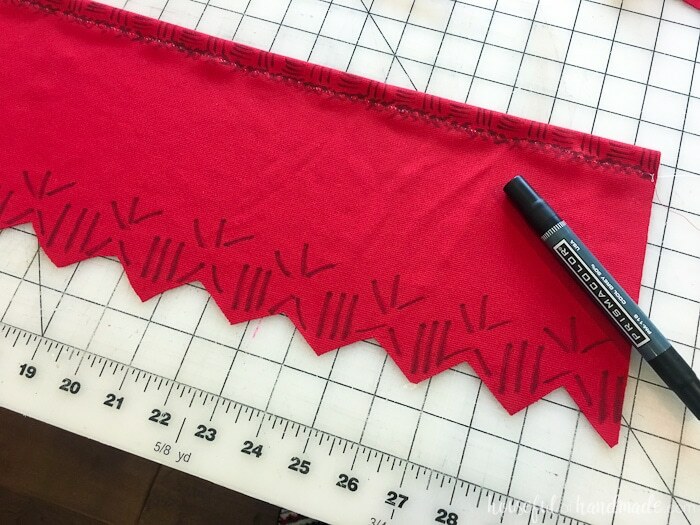 Cut a rectangle out of a piece of red knit fabric to this measurement plus 1″ on each side. Cut the bottom so it is zig zagged. 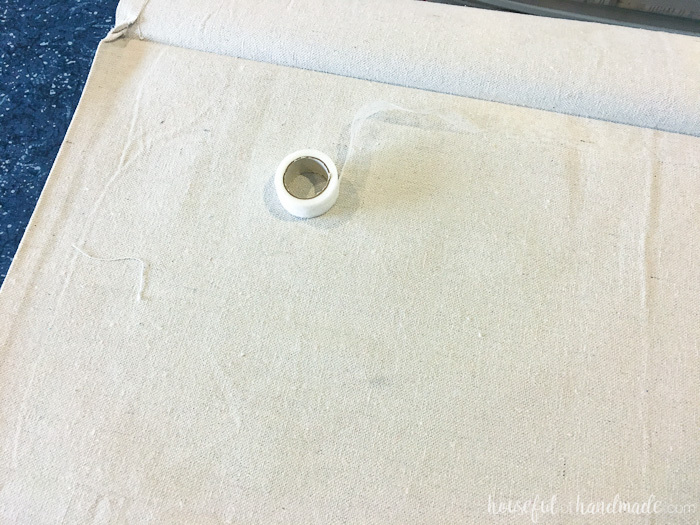 Roll over the 1″ on the top and sew along the edge to create a pocket. Before moving on, it’s time to decorate your top. Using a black marker, add slashes and starts and marks to mimic Moana’s top. I found it was much easier to do this while it was flat. After it was sewed together I tried to add some more elements and it was really hard. Cut a piece of 1/2″ elastic so it is snug on your child just above the bust plus 1″. Feed it through the pocket on the top of the top. pin it flush with each end of the fabric. 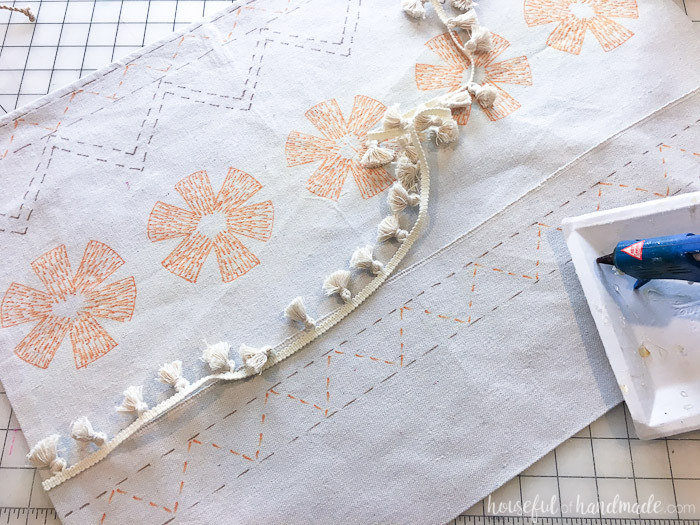 Sew down the center back of the top with a 1/2″ seam, making sure to catch the elastic in the seam. 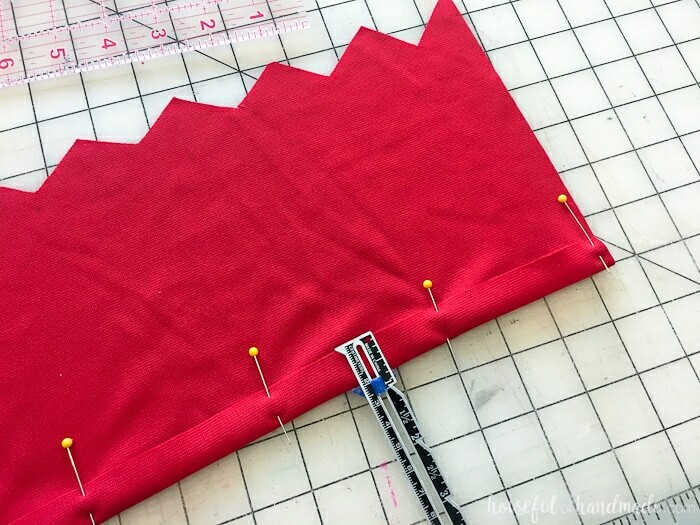 To make the sash, cut a piece of the red knit fabric to the width and length you need. I made mine 3″ wide for a small child, a bigger child might need a 4″ sash. Make designs on the ends of the sash with the black marker and you are done. Measure the hips of your child and the length you want the skirt. 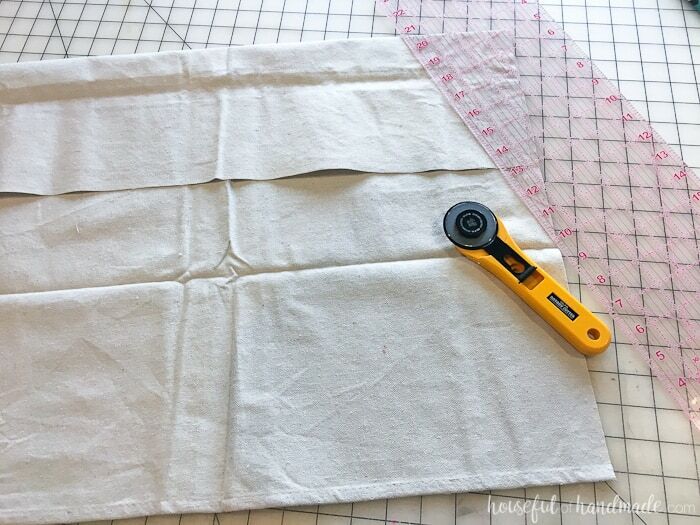 Cut a piece of drop cloth so it is the width of the child’s hips + 6″ and the desired length + 6″. I used the hem on the bottom of the drop cloth as the bottom of my skirt so I didn’t have to hem it. Fold over the 6″ on the top of the island skirt and iron it flat. Then using iron-on hem tape, fold over about 1/2″ seam on the sides of the skirt and iron them flat with the hem tape so they stay. When you get to the top of the skirt that is folded over, you will need to iron back the hem so it is still in the back of the skirt. just kinda twist the hem at this point so that when the top part lays on the top of the skirt, both the hems are in the back. It’s a little tricky, but the bump it leaves will be hidden by the sash. You can also hem the bottom (if needed) and the top flap, I chose to just serge the edge of my top flap and then hid it in a later step. Also, use the hem tape right under the fold of the skirt to keep it flat. Now it is time to decorate your skirt. 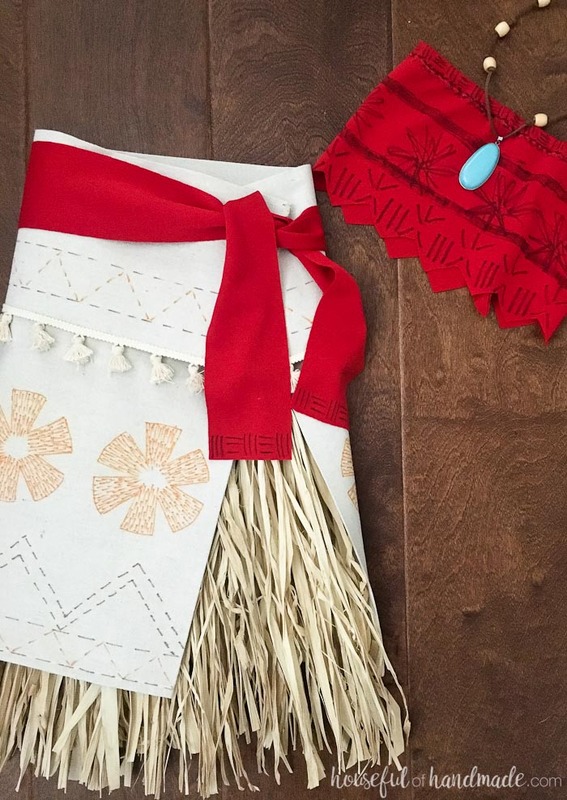 Using brown and orange markers, add the embroidery details to the Moana costume skirt. 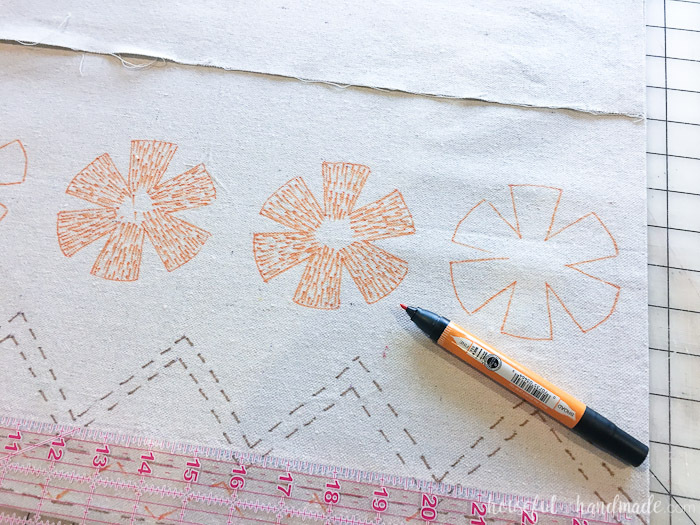 Use dashed lines to make it look like embroidery. 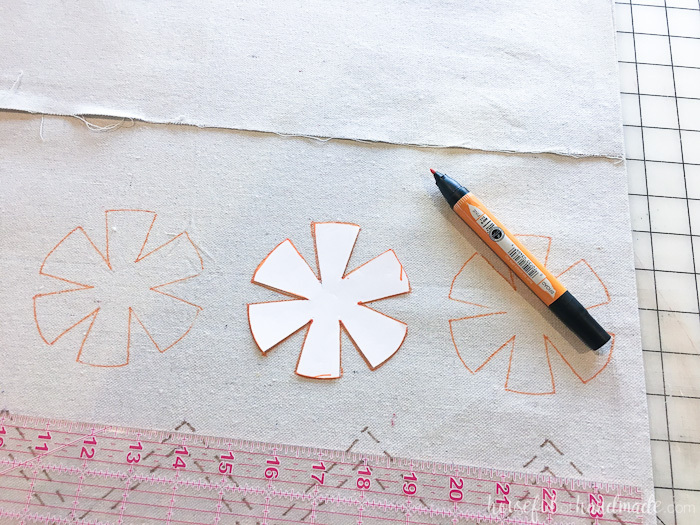 To make the flower pieces, I cut a template out of paper and then traced it on the drop cloth with my orange marker. Then I added a bunch of dashed lines to fill in the flower so it looked like it was embroidered on the skirt. Now try the skirt on your child. Wrap it around their waist so it overlaps about 3″ at an angle. 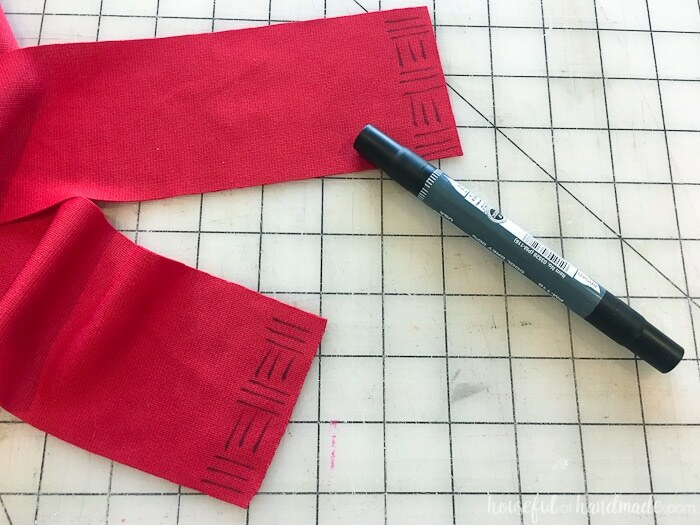 Mark where the skirt overlaps with a disappearing fabric marker. 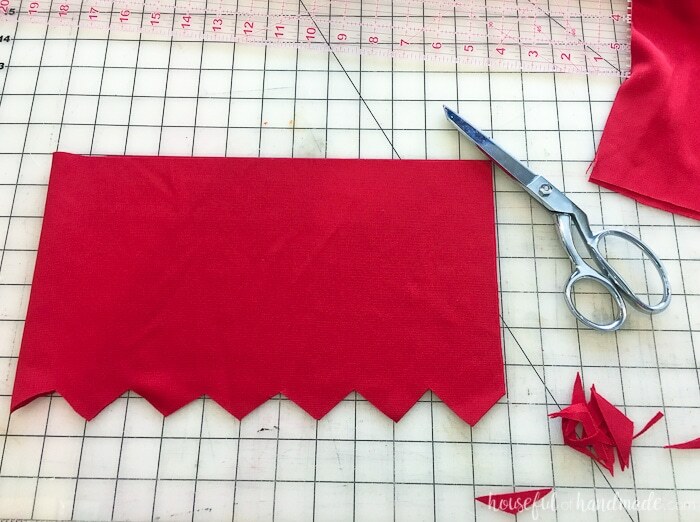 Cut a 3″ piece of velcro and sew one side to the top outside of the skirt closure. Then sew the other side at an angle to the bottom piece of the skirt. You could also glue the velcro on if you don’t want to sew, but I find velcro can sometimes come off if it is not sewn. Glue a tasseled trim to the bottom of the skirt flap. Wrap the ends around the back of the flat to finish off the ends. 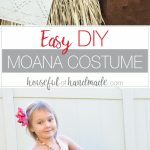 Wear the drop cloth skirt over the top of a grass skirt for the complete Disney Moana costume effect. The last element of the costume is the Moana necklace. We found a turquoise pendant at Michael’s and used a coupon to get it for only $3.00. 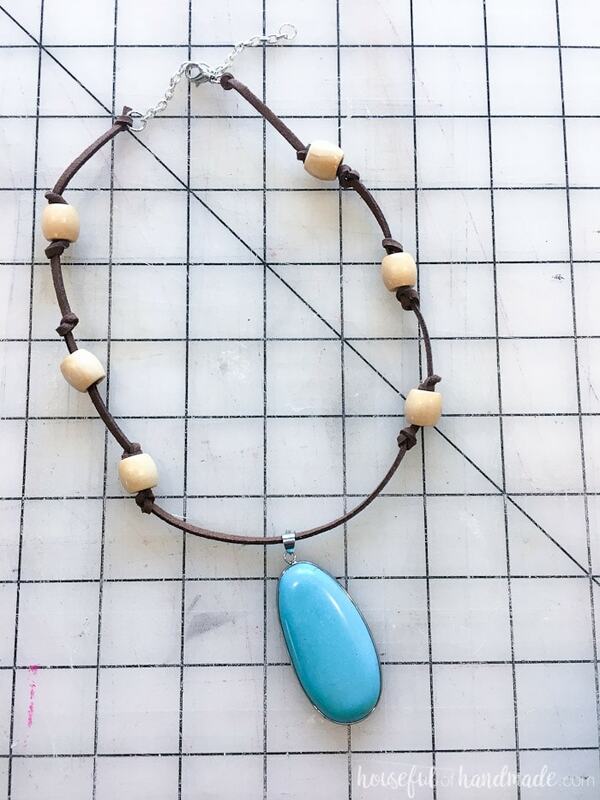 String the pendant on a piece of leather cord. Make sure the leather is extra long if you just want to tie it in the back because it will get shorter as you tie the knots to hold the beads in place. I cut ours too short so I had to use a piece of chain and necklace clasp to allow it to fit over my daughter’s head. Put the pendant in the middle of the sting. Tie a knot on either side of the pendant where you want the beads. Then string on the beads and tie a second knot to hold the beads in place. Repeat for as many beads as you want. Then tie the necklace together at the back. We also decided to add an island flower to her hair. 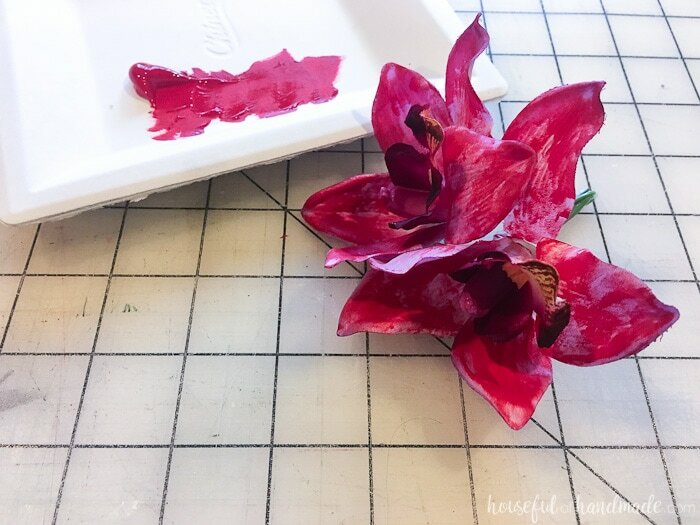 We couldn’t find one the right color, so I decided to paint the petals so they were closer to red than purple. Then I glued it to an alligator clip for her hair. 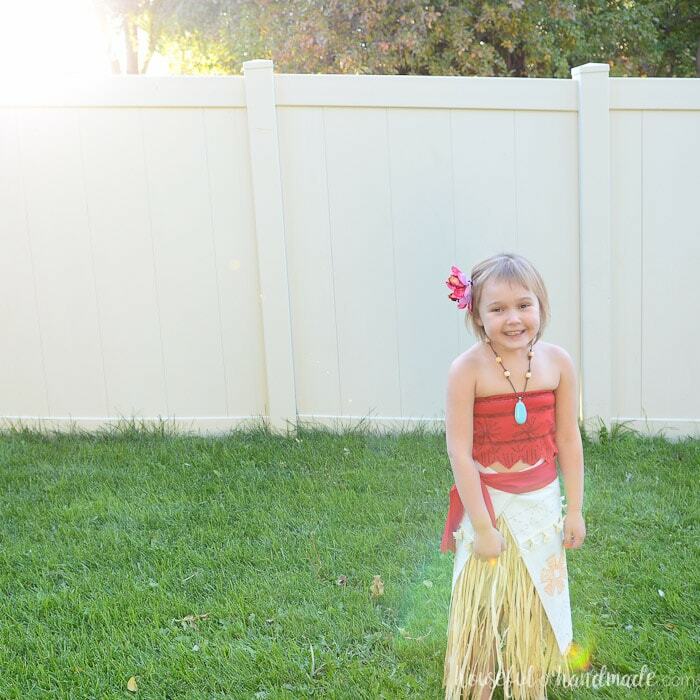 Now she has the perfect DIY Moana costume for Halloween. And I know she will be using it in her dress-ups too. We are all in love with Disney’s Moana! 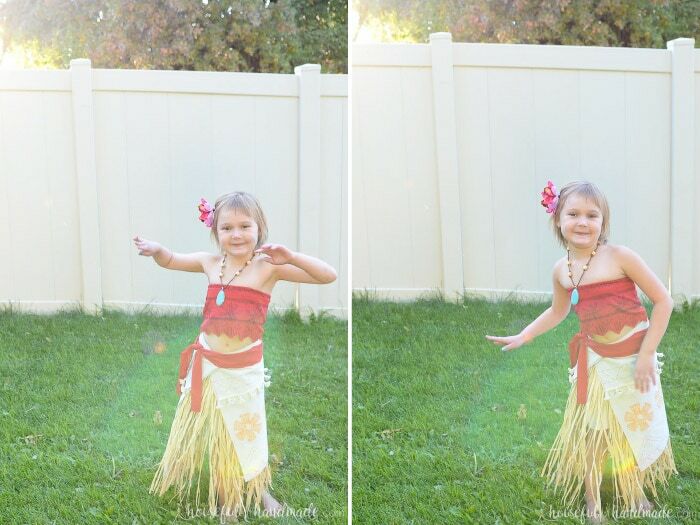 She’s been practicing her hula and Moana songs so she’s ready to play the part! I’m so glad we are one step closer to Halloween, now it’s time to finish up the rest of the costumes and bust out all the Halloween decor.